"What others are saying about Baby Skates!" "The skates are absolutely gorgeous!!! Way more than I ever expected - I actually don't think I will be able to wait until Christmas day to give them!! The engraving option was just great, it looks better that I thought!! I have been showing everyone I know and they are all impressed with the looks, feel, design, and the quality. Thank You so much!" Ice Skater and Hockey Player, proud parent of a little ice skater! "I received the skates right on time as promised...they are great! My husband has played professional hockey for over 18 years, and is currently a professional coach...he has never seen anything so small!! Needless to say we are excited to put our daughter out on the ice (20 months), and get her skating...and know it will be a positive experience for her (double blades will allow for more stability.) The design and engineering involved with the double blades and the blade assembly is just what little ones need, GREAT!" "The BABY SKATES work really well and are safe. My son at (17) months of age can now go out on the ice with me and have fun. My son really enjoys getting his BABY SKATES on and he looks forward to what we call ice skating day. He has really done a good job with maintaining his balance and developing a stride for pushing his way down the ice. I am impressed with how well the ice skates work. THANKS!" "My order of BABY SKATES was handled in a very timely manner. I received an exceptional level of Customer Service throughout! The BABY SKATES arrived in excellent condition and in a very short amount of time. The service and product are both great!" "I am both impressed with the quality and the attention to detail with BABY SKATES. Being a Quality Engineer of many years I know what QUALITY is about. The design is really great and they really do work well! We also had them Engraved and that was just a great added touch that was well worth it!" "Wasn’t sure how it would be for my son going from a BABY SKATES double blade to a single bladed ice skate. When the time came it really took a short amount of time. The BABY SKATES had really worked well and now he is on single blades having fun! They held up really well with no problems at all." Parent of a little ice skater and satisfied customer. "We decided to get a pair of Baby Skates as a gift for our grandson. We had them engraved. It was very easy working with the folks at Baby Skates. It only took a day or to longer for the order. It looked great! My son and his wife were very taken back by them being engraved, they went on and on about it. One happy customer!" "I ordered the wrong size of BABY SKATES. I called BABY SKATES and exchanged my BABY SKATES. The exchange process was very easy, simple, and fast! I was impressed! It was easier than if I went to a store. They were very friendly, very helpful, and very fast! THANK YOU!" "The week after I got my son's BABY SKATES I took him out to the local ice rink. When we got to the ice rink the ticket lady told us right away that she would not have skates for someone as small as him, and we just smiled and said he brought his own BABY SKATES. When we took him out on the ice for the first time he immediately took off running on his new BABY SKATES (with a little help of course!). We love BABY SKATES and recommend them to all the parents at our local rink when they ask us where we got skates so small!" "I received the BABY SKATES and we went skating last week. After an hour of skating we went home, and my son cried for 45 minutes as he wanted to go back to the ice rink. The double blade helped him stay on his feet longer than I expected for the first time skater and two years old. The skates arrived in perfect condition and much earlier than we expected. Thanks a lot, and good luck with your business." "I wanted to let you know I opened the box this morning. I was very impressed by the packaging. I am delighted with the way the skates look. Even my mother who grew up in India and who does not like ice skating at all had to admit that these skates were "the cutest skates ever". " "I just wanted to let you know the BABY SKATES are absolutely beautiful and we are showing them off to all our friend and have taken them to the skating rink to show them off also." "BABY SKATES are wonderful and I just had my daughter out last week. She is 22 months old and skating by herself! Thank you for a great product." "I've always been a huge hockey fan and was excited to get my 19 month old onto the ice. After searching local sporting good stores I realized no one seemed to make an ice skate small enough to fit my son. I did an internet search and came across www.babyskates.com. I was so excited to have found the skates small enough for my son. I placed an order immediately. The skates arrived quickly and well packaged. My son loved them on first sight. I've taken him ice skating several times and he enjoys being out on the ice. The skates fit perfectly and are designed so that kids are able to learn to skate at a young age. BABY SKATES are a great product and I highly recommend them to anyone who has a young child that they would like to teach how to skate. Thank you so much for the wonderful product and overall customer experience." "BABY SKATES are made unbelievably well throughout! They have really redesigned the ice skate for little children. We have come back for several pairs and our little daughter can ice skate and has fun doing so." "It all works great and accompanies each other very nicely. The ice skates work really well and hold up. The design of the ice skate blade is great. The ice skate tote bag is really nice and now my son can carry his own ice skates, like Daddy." Proud parent of a little ice skater. "The engraving was just great! What a neat idea. They made it look better than I imagined. It was a great decision to go with it. Good Job!" 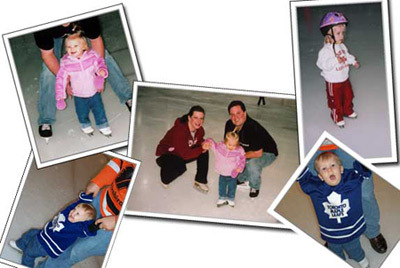 "They were very helpful to me when I was placing an order for the BABY SKATES over the internet. I had never used Pay Pal or bought anything over the internet. They helped me and answered all my concerns and questions. They walked me through the purchase without making me feel unintelligent or putting any sales pressure on. The product is much loved by my grandson and they have used it many times and are impressed with how well it really works. He started ice skating with this product at (16) months of age - outstanding! " & Grandma of a little ice skater! "We had ordered the wrong size of a pair of BABY SKATES for a relative. We mailed the skates back and we received a phone call right away and within (3) days we had a brand new pair of BABY SKATES in the correct size needed. All in time for the special gift! No hassle, very easy to work with." "The ENGRAVING is very nice and makes the BABY SKATES a true one of a kind. They turned out better than I was thinking. I ordered a couple of other pairs ENGRAVED and they all look great! I am very happy, that is why I keep coming back!" Long time hockey player and previous coach. "Well I purchased two other types of ice skates as a gift for my nephews. They both had to go back to the store, they broke on my nephew. I picked up a pair of BABY SKATES and I'm impressed with the durability and how well they fit." "I am a owner of a Pro-Shop at a ice rink. So I have seen a lot of things come in that need a lot of work and sometimes repairs. The BABY SKATES are designed to hold up very well throughout. You can feel and see the great design in the product. They hold up well!" "Great packaging! They came very quickly and in excellent condition. All things were as mentioned and explained nothing was a miss. They arrived all ready to go." "I am very pleased with the entire transaction. The skates are cuter and better than I thought, they really work well, and the ice skate bag and delivery are two great added touches. They make a great item even better." "BABY SKATES was a pleasure to work with! The communication as to where my product was since my order went through was great! Better than most I used in the past. There were no surprises other than the product was better in person than I had imagined. My little niece is very happy and loves to go out skating with me." "BABY SKATES work great and hold up just as well. I have never had to do anything to them except put them on my son and go out and have fun with them." "My daughter really enjoys both ice skating and her pair of BABY SKATES. She even asks to wear them on around the house. The skates have given my daughter a lot of confidence and gave her the chance to go out on the ice and have fun with her family." "I have been involved with hockey and or ice skating for most of my life. I started in the sport and learned to skate when I was seven and now have a son who is a great player on various junior level hockey teams. My experience is over (20) years. I have worked with a lot of trainers, coaches, teams, and even professionals so I know what it takes to master and learn ice skating. The BABY SKATES are better than expected. They are very well built and the design is so different and unique. This gives small children the chance to get out on the ice at an earlier age which in one word is TREMENDOUS! This is an A ++ product. " "I have been around ice skating most of my life. I play on two different women’s hockey teams and have two teenage sons who play for their high school hockey teams. My older son is a strong candidate for receiving a scholarship for his play in the rink. I also have been involved in teaching and instructing young children how to ice skate for many years. The Baby Skates are designed very well with both safety and quality in mind. They serve small children extremely well to assimilate them to the ice by gaining their balance on a slippery surface." "My son had started skating a little later than I would have liked because there were no such things as BABY SKATES. After seeing the Baby Skates up close and in action, I am impressed not only are they cute but they work. They're just neat and work well with small children. The small children just enjoy being out on the ice with the other children." "My daughter and I went to go have some fun together at the ice rink. I know how to ice skate fairly well and figured I could start to show my daughter. When we arrived at the rink they did not have my daughter’s size, not even close. I looked all over for a training skate or ice skate in her size and couldn’t find a thing. After hearing about Baby Skates and purchasing a pair my daughter and I have fun at the rink together. As I hold her hand and help her I am remembering how unique the experience was for me when my father held my hand. It creates an opportunity for fun and learning rather than sorry we don’t have her size." "This is a very cute and unique product. It is very well built and constructed with great features. I think that the way it has been developed over time is a miracle. BABY SKATES, LTD gives the opportunity to share a little Blessing with your child." "I purchased a pair of BABY SKATES for my son and he loves them. He doesn’t want to leave the ice. I am having fun too. He can now ice skate with me. He is having fun and so am I. The BABY SKATE is made very, very well, the quality is impressive. The shipping, delivery, and customer service exceeded my expectations hands down." "We get a lot of different featured items. This one however is the real deal. It is what it is supposed to be; quality, design, integrity, comfort, and warranty. I see a lot of new products and this one is a keeper. Keep up the good work." "I have tried to be a successful part of teaching little ones how to ice skate. I have seen this product work with my own eyes. It really gives smaller children the chance to get out on the ice and learn the necessary elements of ice skating. Before all we could offer the parents or little children was the answer no or a seat. Now we can offer them the chance to learn how to ice skate and teach them a fun activity. " "When I first laid eyes on them I could not believe how cute they are. They are really cute! The finish to the blade is very similar to a real one. It is designed with quality and safety in mind throughout, you can just see it, very neat item." "I think they are neat. If they were around when my son was younger I may have taken him ice skating. The integrity of the product speaks for itself. BABY SKATES spares no costs for producing a high quality affordable product. Now we can all skate." "BABY SKATES has thought out all the details, hats off to them. It is not made of poor materials or quality. It had been well thought out. To see and hear all the prototypes, models, and research that were being done is just incredible. No corners were cut. It is a true miracle and blessing." "Wow what a neat ice skate. Not the typical double bladed ice skate. It has been well thought through. You get what you pay for and with BABY SKATES you get a lot. Great product and many thanks." Hockey Player and ice skating fan for over (15) years. "When I arrived at a hockey tournament I didn’t expect to see a little guy on ice skates. What I saw was a (16) month old child out on the ice and having fun with the other kids. It was neat. The skates really worked. It may introduce a new generation of ice skaters to the sport. Why not? If they are having fun. I would have like to use them if I had the chance."